This was a Diaper cake I made for my niece's Baby Shower. I used a foil-covered cardboard base, baby bottles for the "core" and a Rattle topper. I tucked baby spoons, combs, and toiletries around. Wrapped layers in white tulle, and overwrapped in cellophane and ribbons. Found an adorable (and CHEAP) wire cake plate at Christmas Tree Shop and set the whole thing upon it! My niece and her Mom loved it, and shower guests were wowed! 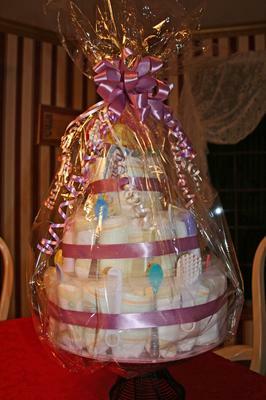 This is one of the best website which have amazing collection of Diaper cakes.